Pine Valley Ranch Open Space is operated by Jefferson County, Colorado near the small town of Pine along the North Fork of the South Platte River. We executed the civil and structural design associated with five prefabricated steel pedestrian brides that extended the usefulness of the existing trail network within the park. Hydrological studies were performed at each intend bridge location to quantify stream and floodplain impacts for regulatory purposes. 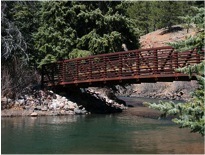 Abutments and trail approaches were designed and inspected prior to bridge placement and trail completion.